DEATH VALLEY SUMMARY: I highly recommend a visit to Death Valley to anyone who appreciates nature, especially the delicate beauty and peaceful silence of desert environments. You’ll need at least 2 full days (preferably 3 or 4) in the park to just see some of the highlights. It rewards visitors with hiking, golfing, biking, camping, jeep tours, horseback riding, swimming in natural hot spring-fed pools (at the Furnace Creek Inn and Ranch), the amazing Scotty’s Castle, auto accessible touring of the park’s main features, star-gazing (due to the exceptionally clear skies), abandoned mine sites and varied ranger programs. 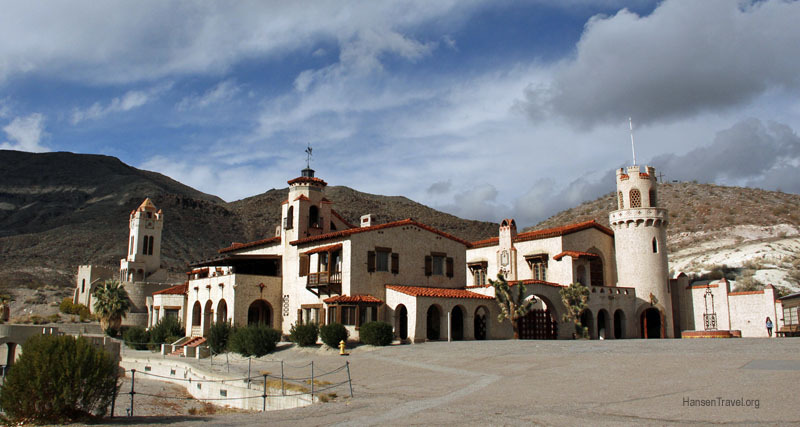 It has some very comfortable hotels (the Furnace Creek Inn, and Ranch—see below), its features can be enjoyed by folks ranging from the most to the least active, and there’s a nice combination of interesting human history mixed with compelling natural history. This place is a lot more fun than you first expect. PLANNING TIP: Plan ahead because there are certain times (such as Christmas break, and July/August) when lodging is fully booked. Early December, just before the school holiday, was great—no crowds—but it gets really cold at night in the winter months, so bring layers for warmth. 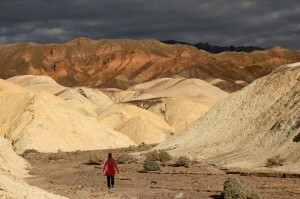 OVERVIEW: Death Valley is the largest park in the U.S. outside of Alaska with over 3.3 million acres. 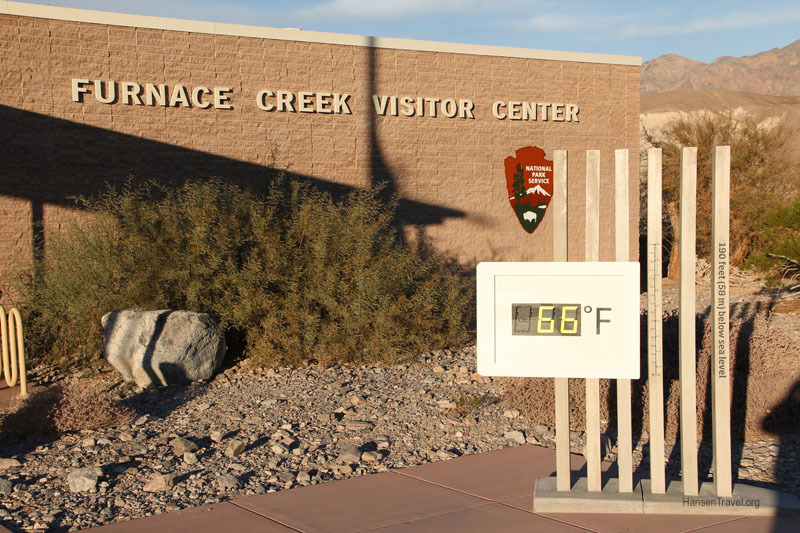 The sign in the Visitor’s Center says it best: HOT (world record temperature holder, 134 F or 57 C), DRY (less than 2 inches of rain per year) and LOW (282 feet below sea level–the lowest spot in the North America). Hard to believe native Americans lived here for over 10,000 years. One thing that makes this park special is the contrast between the long, low-lying valley and the craggy mountain ranges that frame the north and south sides of the valley with peaks over 11,000 feet high (they are gorgeous when covered with winter snow). GETTING AROUND: The vastness of the park means that driving times are longer than you might expect; for example, from the convenient Furnace Creek location it takes 20 minutes to drive south to Badwater, 30 minutes north to the sand dunes and an hour up to Scotty’s Castle. Fortunately, the main roads are in great condition. There are dirt roads leading to some sites, but without a jeep or truck, I wasn’t willing to risk driving on them in our passenger car. RESOURCES TO PLAN A TRIP: Check out the park’s official Death Valley National Park Visitor’s Guide, found at: http://www.nps.gov/deva/upload/Visitor-Guide-2011.pdf. Another good resource is the Oh, Ranger website (their 64 page booklet about the park is quite useful): http://www.ohranger.com/death-valley. ARRIVAL TIP: As soon as possible when you arrive at the park, go to the Furnace Creek Visitor’s Center to get properly oriented to the park. Don’t miss their terrific movie about the park. HIKING TIP #1: If you like hiking, the rangers can advise you about which trails will suit you, and they have free handouts with descriptions and detailed maps of each major hike. I strongly recommend you get these handouts since not all trails are clearly marked. HIKING TIP #2: Wear hiking boots. Even though I prefer hiking in my running shoes in most places, I wouldn’t wear them here; the trails are very rocky and rough. WILDFLOWERS: When conditions are right, spring wildflowers are one of Death Valley’s top attractions between late February and April. The amount of flowers depends on the amount of winter rainfall, so keep an eye on amount of rain and check directly with the park to find out the flower status. Sunrise or sunset at the sand dunes is a must if you are into photography. Otherwise go anytime and have a blast walking, sliding, running up and down the huge sand dunes. Star gazing: the skies are so clear that this place is known for inspiring nighttime views of countless stars and the Milky Way. Bring your telescope or binoculars. Golden Canyon / Gower Gulch hike: this hike was terrific, a 4 mile loop that was easy to moderate. See description below. Artist’s Drive is a must-see, 9 mile, paved, one-way loop. The color of the rock in some areas must be seen to be believed—many shades of green, blue, pink, purple, beige, yellow, white and black. Allow time for some short hiking around the Artist’s Palate area. 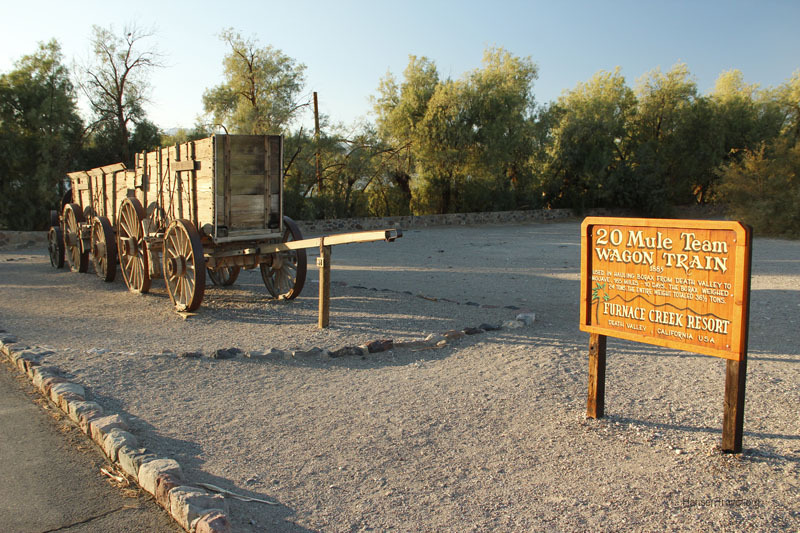 The Borax Museum at the Furnace Creek Ranch is amazing and history buffs will want to spend at least an hour here. The small museum building, the oldest in the park, is crammed with photos and artifacts from the old days that show the mining, stage coaches, early railroads, 20 mule team borax hauling, etc. Ask in the musem for the free printout that explains what the dozens of artifacts in the back yard are. 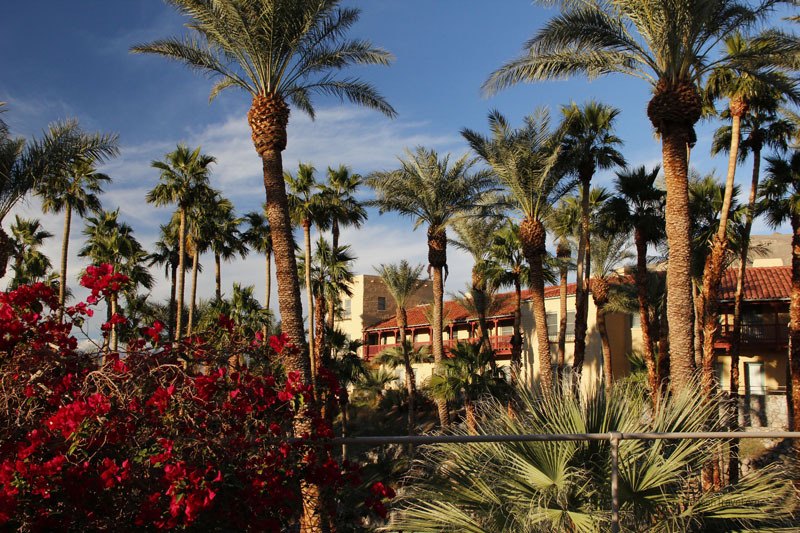 Walk through the amazing garden/pond area of the Furnace Creek Inn; you won’t believe that you’re in the middle of a desert. Swimming in the 85 F natural spring fed swimming pools of the Furnace Creek Inn or Ranch (if you’re a guest). CAR: Coming from the south, we drove on the 15 Freeway to Baker, then took the 127 highway north to the 190 which leads to Furnace Creek in the park. 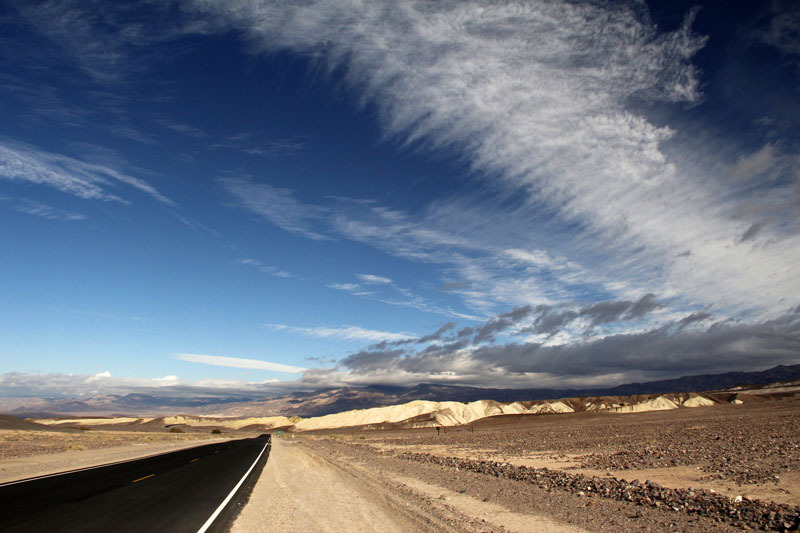 Alternatively, you could take the 395 north to the 178, pass through the dilapidated town of Trona and enjoy the views of the Panamint Valley. This is a prettier drive than the 127, but the painfully slow and abundant truck traffic on the 395 is something to consider. Coming from the north, you could take the 136 from highway 395 and head into the park through Stovepipe Wells; in the winter, you’d better check on road conditions for this route. AIR: The nearest airport is in Las Vegas, about 120 miles from the park. TRAVEL TIP: Whichever route you choose, FILL UP WITH GAS before heading towards Death Valley on the smaller roads. We left Baker, in our Prius, with half a tank of gas, and an hour later we had not seen any sign of civilization until we coasted into tiny Shoshone, with our gas gauge flashing on Empty, where we gladly paid almost double the normal price for gas ($5.55 gallon for regular, versus $3.55 in Baker). The Chevron gas station in Furnace Creek was $5.05. Obviously gas prices will change, but this gives you an idea of the relative costs. BADWATER: the most famous place in the park, the salt flat with fascinating white crusty patterns, 282 feet below sea level—lowest spot in North America. Plan on spending between a half hour and an hour walking in the middle of the flat valley with its oddly textured salt crust. DANTE’S VIEW: “one of the most extraordinary sights anywhere in California”; we couldn’t get up there because the road was closed due to snow; 13 miles from the main road. Check it out and let me know…. ZABRISKIE POINT: One of the most popular lookouts with a great view of the colorful badlands, valley and distant mountains. Great spot for sunrise and sunset views. GOLDEN CANYON/GOWER GULCH – OUR FAVORITE HIKE: This hike was everything I had hoped for—a well defined trail that led gently uphill past lots of narrow ravines on both sides. The rocks displayed every color, shape and texture you can imagine. About halfway through the hike is a side-trail to Red Cathedral, which is worth the extra ¼ mile detour. Climbing up a steeper section of trail, you reach a decision point: either you go up to Zabriskie Point, 1 ½ miles uphill, or continue on the 4 mile loop via the Gower Gulch Loop. We picnicked halfway through the hike, and savored the view of the striped, jagged hills framing the distant valley and snow capped mountains. Including the Red Cathedral sidetrack, and our picnic time, the 4 mile loop took about 3 hours. HARMONY BORAX WORKS: A picturesque spot with remnants of a mining operation from the 1800’s. A short loop trail provides good photo opps from the top of the trail. It’s fun to see the famous “20 Mule Team” borax wagons. It’s just off the road and takes 15 to 30 minutes to see. MESQUITE FLAT SAND DUNES: One of the highlights for me; I loved the late day lighting on the soft, undulating sand dunes that contrasted with the crinkled mountains in the background. Walking and running up and down the dunes is a blast. It’s easy to spend at least an hour or two, because the dunes are a distance from the parking lot and walking on the soft sand is time consuming and tiring. SCOTTY’S CASTLE: This is a “Don’t Miss” place. Built in the 1920’s by a super-wealthy Chicago couple, it is still elaborately furnished with all the original décor, and you won’t believe the clever engineering feats that the owner used to provide heat, air-conditioning, refrigeration, running water, electricity and even organ music. Most amazing of all is the incredible story of betrayal and close friendship between the scurrilous Scotty and the big-city wealthy couple. Allow between 2 and 4 hours here. There are three tours offered: House Tour ~1 hour (a must), Underground Tour ~ 1 hour (a maybe, ), and Lower Vine Hike to Scotty’s real house ~2.5 hours. A snack bar and picnic tables make this a consideration for your lunch stop. 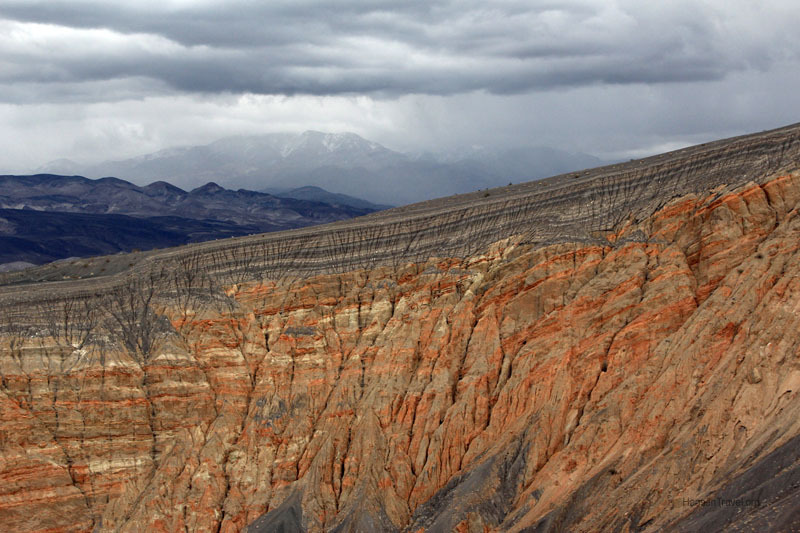 UBEHEBE CRATER: Not far from Scotty’s Castle (8 miles away) is this dramatic, colorful volcanic crater. It is certainly worth seeing; very photogenic; and an inviting trail circles the rim of the crater or heads down into the bottom of the crater. A visit can be done in as short as 15 minutes, or if hiking, a couple of hours. RACETRACK PLAYA: I would have loved to see this famous mystery spot, where large rocks have inexplicably moved across the mud flats for long distances, by themselves, leaving clear trails along their path, but no answers as to how they moved! Sadly, the access road is 28 miles of dirt and rocks, requiring a truck or jeep. This is at least a half day journey to see. RANCH AT FURNACE CREEK: 224 rooms provide a variety of sizes and rates; our room was attractive and newly remodeled, with rocking chairs on our back patio. The Ranch is a large, historic compound that offers visitors a post office, museum, general store, five restaurants, swimming pool, golf course, horseback riding, combination tennis and basketball courts, bike rentals, bocce ball, shuffle board and airstrip. Clearly this place is great for families with kids. A gas station and the park Visitor’s Center are nearby.